Happy fifty third birthday, Doctor. Welcome to the first day of your death. Dr. Frederick Starks, a New York psychoanalyst, has just received a mysterious, threatening letter. Now he finds himself in the middle of a horrific game designed by a man who calls himself Rumplestiltskin. The rules: in two weeks, Starks must guess his tormentor’s identity. If Starks succeeds, he goes free. If he fails, Rumplestiltskin will destroy, one by one, fifty-two of Dr. Starks’ loved ones—unless the good doctor agrees to kill himself. In a blistering race against time, Starks’ is at the mercy of a psychopath’s devious game of vengeance. He must find a way to stop the madman—before he himself is driven mad. . . .
Me gusto bastante, la verdad. Me mantuvo queriendo saber mas, hasta que llego el final! 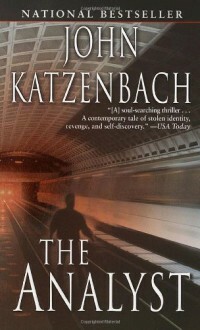 This is my first John Katzenbach read, but certainly won't be my last. If you're looking for a thriller loaded with suspense, this book may be for you. Definite twists and turns make this a hard book to put down.